DALLAS, Nov. 15, 2018 /PRNewswire/ — Carapelli, the world’s number one premium extra virgin olive oil, will celebrate the season of culinary delights on TLC’s “Make This Place Your Home” this Saturday, November 17 at 9 a.m. EST. 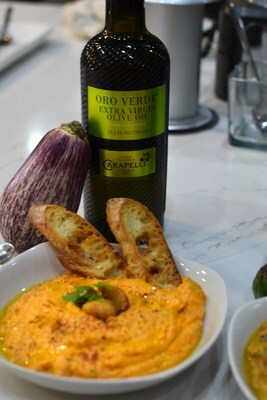 In the program, Italian-American celebrity chef and entertaining guru Jaime Laurita and his co-host, actress Jackie Zeman craft a Holiday Roasted Pepper Dip featuring Carapelli Oro Verde Extra Virgin Olive Oil. The smooth, peppery and fresh taste of the oil enriches the seasonal flavors of this savory dish, making the delectable appetizer perfect for holiday gatherings. Inspired by the craftsmanship, artistry and award-winning mastery of Carapelli, Laurita’s custom recipe includes high-quality ingredients such as rich goat cheese, roasted red peppers, poached garlic cloves and fresh basil. During the episode, viewers learn how to create the dip and garnish it with extra virgin olive oil, for an elegantly plated delicacy. During the episode, Laurita and Zeman also explore the flavors and subtle complexities of Carapelli’s Extra Virgin Olive Oils during a tasting led by Larissa Iracheta, olive oil sommelier at Carapelli. Oro Verde Extra Virgin Olive Oil is masterfully crafted from the first cold pressing of the olive, nodding to Carapelli’s Tuscan heritage with a bitter, fresh tasting oil. Organic Extra Virgin Olive Oil is soft, balanced and fruity with hints of apple and almond. These exquisite flavors are a result of high-quality olives nurtured by nature, selected at optimal harvest time and delicately handled. ‹ Cheese Festa 2018 at Tokyo	› Vinitaly Russia: nazdaróvye!